This is the second collaboration I have had with a very talented artist, Lisa Humphreys. She is a cake genius who makes impossible sculptures from just batter and icing. I built the web site adding animation and interactivity to her layout. Bon apetit! A new era has begun for me. Last March I finally stopped being stubborn and bought a car to replace my aging, but trustworthy 1994 Acura Integra. I drove that car for over 11 years and we had many trips and adventures together. Not to mention a few tickets. Ah, the memories. My new car is an improvement on the old one... 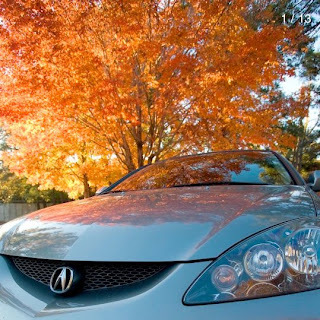 It is a 2005 Acura RSX Type S. It is very similar to my old car except, much nicer, faster, better built and kids don't point at and laugh anymore. I can finally get some respect on the streets. This still does not prevent my car from getting dinged in parking lots. I guess some things never change. My neighbor wanted to buy my old car to play with it. I can visit it any time that I want to, but mysteriously, I never have. Presentech.com is a fantastic service bureau in Atlanta, Georgia that specializes in large and small format color printing. I redesigned their old web site for better usability. I got an opportunity to photograph a exotic Italian sports car at dusk in Ackworth, Georgia. The car was being sold a few days later so we had one chance to make the photos as a lasting memento of the car. We could have done more with more time, but the good light only lasted a few minutes.